Your school can participate in the national Dream Chain! Bestselling author and educator Susan V. Bosak is a Dream Messenger connecting schools in a very special and meaningful way. 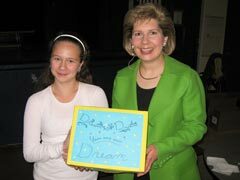 Students in each school she visits make Dream Stars with their dream or goal for themselves or our world. 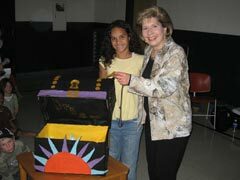 Students package their Dream Stars in a decorated box or bag and give it to Susan. 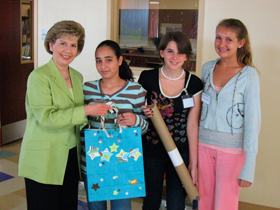 At the next school Susan visits, she presents your Dream Star gift to the students of that school. Schools across the country are connected as part of this Dream Chain celebrating the hopes and dreams of all students. Find out more about the Dream Chain and school presentations. just opened in Wellington, Florida. Approximately 70 sixth, seventh, and eighth grade students in a Teen Leadership course made origami Dream Stars with their goals written inside. Since Emerald Cove was the first school in the Dream Chain, and there was no group of students before them, teachers in a literacy workshop author and educator Susan Bosak ran offered to make Dream Stars with special messages of hope and motivation for the students at Emerald Cove so that they too could receive a Dream Star package. The 95 teachers at Londonderry Middle School in Londonderry, NH wrote a note to the students at Emerald Cove: "As teachers of middle school students, we experience the talents and enthusiasm of our students every day. We always appreciate how our students express their creative energy to us and to each other in delightful and diverse ways. We love working with our students to help fulfill their dreams and hope that message is conveyed to you today. We believe the potential lies within you and are honored to be a part of it." 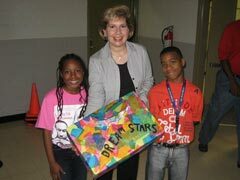 The seventh grade students at Aventura City of Excellence School (ACES) made 182 Dream Stars. Each student made two stars – one with a goal for themselves and one with a dream to make our world a better place. Students at ACES are encouraged not only to dream, but also to live by the Living Values: peace, respect, love, tolerance, honesty, humility, cooperation, happiness, responsibility, simplicity, and unity. Writes principal Julie Alm, "We hope that all your dreams for yourselves and our world will be encouraged through our link in the Dream Chain and hope that our stars will inspire others to dream as well." 30 miles south of the Alabama line. All 275 students created Dream Stars. Since the school has been adopted by a local Native American tribe, the principal, Dr. Karen Barber, handcrafted a large dream catcher with real feathers and wove the center so that students could fill it with their Dream Stars. Writes Reading Coach Rachel Musser on behalf of the teachers and students, "We have joined a new club, the Club of Dreamers, and our wish is that all of our dreams will color your world in shades of brightness to make your lives and the lives of others better." In response to Susan Bosak's book Dream, the students at Ross Elementary are participating in a year-long reading and writing project. Each student is creating their own "Dream Journal" to imagine their own dreams and illustrate their hopes for the future. The grade 3-6 students made 350 Dream Stars with dreams and wishes for their own future, their family, and our world. The dreams are starting points for discussion and writing throughout the school year. "We are searching for ways to create a more hopeful and wonder-filled world." The students and teachers at Ross Elementary were thrilled to receive the dream catcher from Chumuckla Elementary – especially since Ross Elementary uses a Native American in full headdress as an emblem at their school. 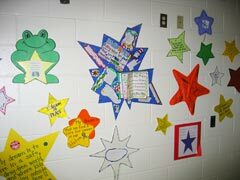 The kindergarten to grade 6 students at Green Valley Elementary made 389 stars with their dreams and goals. Green Valley Elementary is located in a suburb of Cleveland, Ohio. Author and educator Susan Bosak's visit was actually a dream fulfilled by PTA President Marie Laheta, who had met Susan at the national PTA convention. 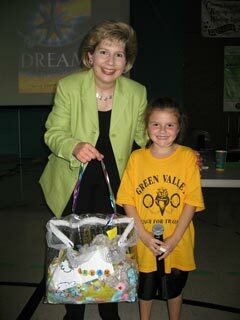 When Susan announced that Green Valley Elementary was receiving a Dream Star package from Ross Elementary in Pittsburgh, Pennsylvania, there was a surprising coincidence – one of the teachers at Green Valley Elementary had attended Ross Elementary as a child and one of the teachers who still teaches at Ross Elementary inspired the young girl to become a teacher when she got older. 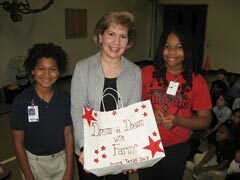 288 students welcomed Susan and were excited to present their Dream Star package along with a special poem written by principal Marina Schoon. In part it read, "At Spitzee School we're dreaming/Dreaming about being a special place where we all belong and respect each other./At Spitzee School we're dreaming/Dreaming about making a difference at home and abroad…/And now our dreams will travel in this special box with our wishes and goals./We hope you too will catch the star/That will begin to take YOUR dreams afar." Students from kindergarten to grade 6 created 250 Dream Stars to present to Susan Bosak as part of her visit to Sunalta School. Principal Chris Aylesworth said he had been a Dreamer all his life, and that one of his dreams was to make his school a place that encouraged students to become all they could be with rich experiences like author visits and opportunities to share with students at other schools. Teacher Doug Noakes explains, "we believe students learn by doing and that their learning and understanding creates our future. Thinking about dreams and goals is an important part of this process." As students share their personal goals, Doug Noakes encourages everyone to think about how they can help someone reach their goals. "By thinking this way, we help each other to make our dreams come true." 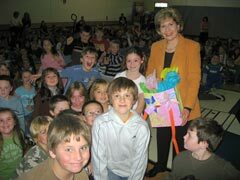 to Principal Cathy MacLeod when they discovered both had been born in Winnipeg, Canada! 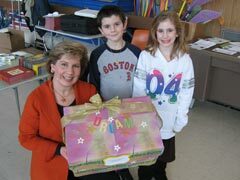 Bryantville Elementary, located just south of Boston, contributed approximately 300 Dream Stars to the Dream Chain. After Susan presented to kindergarten to grade 6 students, and did a teacher workshop at the school, she participated in Bryantville's Literacy Night, signing both Dream and Something to Remember Me By books for students and parents. Say the Dreamers at Bryantville, "We imagine that some of our dreams may be the same dreams that you wish for in your lives and in our world. Our wish for you is that all your hopes and dreams come true. Remember to always dream, because each Dreamer can make our world a better place." 2007 is a special year for Columbus Elementary, located 45 minutes north of New York City. They are celebrating their 50th birthday! Their dreams began in 1957 and continue on today in the hearts and minds of Columbus families. 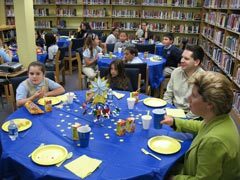 To help celebrate, Susan Bosak was invited to a special luncheon with a class of grade 3 students. After enjoying pasta, sandwiches, salad, and a dream cake and star cookies, Susan answered questions from the students and got to know them. Then it was on to a huge assembly in the school gym for all the grade 3-5 students. 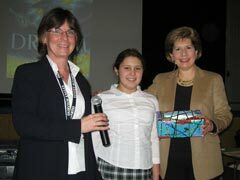 They presented Susan with 365 beautiful Dream Stars lovingly created with the help of art teacher Lauralee Chambers. "With every birthday comes the making of wishes. We have closed our eyes tight, blown out our candles and sent into the wind these Dream Stars with our wishes for you to treasure. 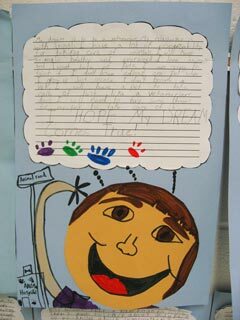 The children at Columbus Elementary pass on the gift of their words and their creative spirit. We hope that you always grow in wonder and never give up on your dreams. Shine like the stars you are, be the bright light of our future, and express your true self in all that you do." Located near Philadelphia, Garrettford Elementary is a grand old school nearly 100 years old. 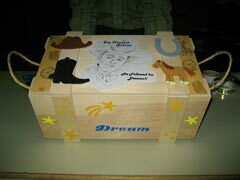 Students from grades 1-5 contributed 535 Dream Stars in a replica of the Dream Chest illustrated in Dream. Principal Wayne McAllister had his arm in a sling after recent shoulder surgery, but that didn't stop him from participating enthusiastically in Susan Bosak's presentations. The school's year-long theme is "Dream to Become" and Wayne McAllister has been encouraging student dreams at the school for 25 years. He explains, "Garrettford is 'A Great Place to Grow.' We want all children to be surrounded by wonderful families and school staff who will support them and guide them to become wonderful adults so that this world will be 'a great place to grow' for us all." K-12 school. 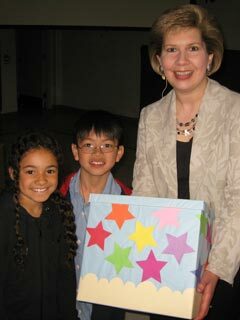 570 students in grades 2-8 created Dream Stars and presented them to Susan in a handpainted wooden Dream box. Tracy West-Bernstein is the Enrichment Coordinator at MaST and writes, "Nine years ago, a group of teachers, parents, and students shared a dream. They dreamt of a school where teachers could do what was best for all students, a place where children were excited to come each day to learn, and a place where parents always felt welcomed and involved. That dream has become our place: MaST Community Charter School. Chasing the dream of a K-12 school was not an easy task. We started out in a shopping mall and rented spaces at local synagogues. We were in five different locations, but somehow our dream held us together. We finally found a building where we could all fit snuggly. Over the next few years, we conquered one obstacle after another to build a new building. At MaST we believe that it takes a team to make a dream. Our dream will never die as long as we have dedicated teachers and administrators, enthusiastic students, and caring parents. And so, our challenge to you is to find a dream of your own – pursue it, nurture it, and never let it die. No matter where you live or what you look like, people all over the world dream about the same things. What a wonderful place the world would be if we could all come together with our shared dreams and make them a reality. We did it at MaST! Can you?" "In our Dream Stars you'll find our personalities, ranging from humorous to serious with much creativity in between. You'll find hopes and dreams for individuals, as well as for groups of people at a more global level. You can also see our individual styles through our decorative approach to the various stars. This is a wonderful way for children from different places to get acquainted. Perhaps someday we will all get to meet and celebrate our uniqueness!" 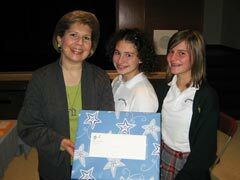 Susan Bosak visited this junior middle school in Toronto, Ontario, Canada thanks to an invitation from Parent Council member Jane Taylor who had seen her speak to a Girl Guide group. Students from grades 1-8 contributed 300 Dream Stars. "It is our wish that all students everywhere are enabled to reach high levels of both personal achievement and satisfaction. We dream of enriched academic environments that are accessible to all. We hope that your school is full of wonderful teachers and, more importantly, that your students are rich in their compassion for others, strong in their commitment to learning, and that they have a passion for life." 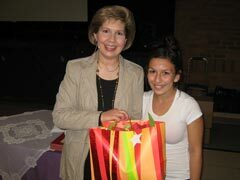 Susan Bosak was lucky enough to spend two days at Poplar Bank school in Newmarket, ON, Canada, north of Toronto. One day was spent with teachers in a literacy and goal-setting workshop, and the other was spent with students from grades 1-8. Poplar Bank contributed 650 Dream Stars in a bag decorated with the names of all the countries of origin of the diverse student body. Not only are they collecting the dreams and goals of their students, but they've also invited parents to send the school the dreams they have for their children. Each morning, some of the dreams are shared during the announcements to encourage and inspire both staff and students. Vice Principal Kim Wagner says the wish of their school for others is: "Believe in the richness of cultural diversity, do the right thing by fostering positive relationships with each other and by celebrating the differences and similarities, and think of the role each person plays in fostering inclusion in an ever-expanding global community. Engaging and celebrating our diversity will bring us all closer together." was École Fairview School, a French immersion middle school. Grade 5, 6, and 7 students contributed 240 Dream Stars. Says teacher Dawna Jean Wiens who helped organize the visit, "As each Dreamer is unique, each dream is unique. Our wish is that we will all create a better world through our dreaming and through pursuing our dreams." 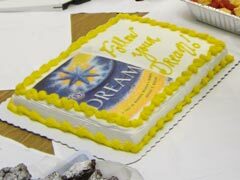 As part of the kick-off for their reading fundraiser two years ago, St. Clare School used the Dream book to create a theme and focus for their reading. Principal Joe Piechotta created a backdrop for his reading corner. He spent time reading to each of the classes and talking about the importance of dreams. The school showcases were filled with illustrations from Dream, as well as student art and written work. Students and staff talked about how wonderful it would be to meet the author – and so they invited Susan Bosak for a visit when they found out she would be coming to Calgary. 560 kindergarten to grade 6 students, as well as school staff, participated in an exciting journey into the world of dreams and wishes, even learning about such famous contemporary Dreamers as Colonel Sanders and Walt Disney. "Interesting how things in our life happen for a reason. We are so delighted to now be a part of the Dream Chain." Canyon Meadows is a Spanish bilingual school. Kindergarten to grade 6 students contributed 480 Dream Stars. 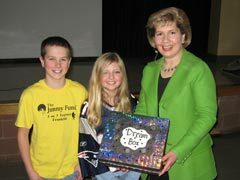 Music teacher Kathy Sorensen helped organize Susan Bosak's visit and worked with students on a special dream-themed song they sang after Susan's presentation. Then, everyone joined in singing the school spirit song. Here are some of the lyrics: "Escuela Canyon Meadows, it's the best school you can see/Through caring, sharing, learning, that's great for you and me./We'll dream our dreams together, just watch us as we grow/In Spanish or in English, it's the best place we all know!" Stanley Jones School in Calgary has over 90 years of history in the community. Deaf and Hard of Hearing, Community, and Alice Jamieson Academy for Girls. 338 kindergarten to grade 9 students contributed to the Dream Chain. The Parent Council made Susan Bosak's visit to the school possible. Two students taped portions of Susan's two presentations so that parents can check out the video from the library and continue to encourage the dreams of their children. 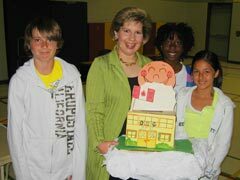 Says Patricia Ballance, grade 6 teacher, "Our school motto is 'Children come first and last.' We believe that the dreams of our children are the future for all of us." Alberta is a Canadian province whose past and present are full of Dreamers who moved there to follow their dreams. But no Dreamer ever had a greater lasting impression than the one made by the man who brought the Greatest Outdoor Show on Earth to life – Guy Weadick. He was a well-known Wild West performer who envisioned a cowboy championship that paid tribute to the old west. And so, after a lot of work and perseverance, the Calgary Stampede was born in 1912. Today, the stampede is a world-class event that attracts hundreds of thousands of people to Calgary every year. How would Calgary be different today if Guy Weadick had not followed his dream? The namesake of this school reminds staff and students every day that one person can make a difference. 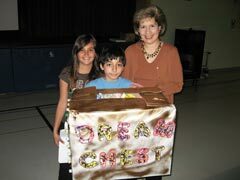 Guy Weadick and his dreams inspired the Dream Chest the 340 kindergarten to grade 6 students filled with Dream Stars and presented to Susan Bosak. Write teachers Stacey Hinks and Anne Nicholls on behalf of the school, "Even if someone's dream seems very hard to accomplish, encourage it anyway. Who knows what wonderful accomplishments we'll have 40 years from now." The Laureate Academy in Winnipeg, Manitoba, Canada is a small alternative school that encourages and celebrates the unique potential in every student. 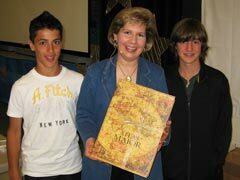 Author Susan Bosak was greeted enthusiastically by students from 8 to 15 years of age. They had lots of questions and comments on her book Dream after studying it for the past two years. Among the many activities they had done with the book, each student had selected a member of the Club of Dreamers, learned all about that historical person, and then presented the information they found to their classmates. Students contributed approximately 40 Dream Stars. 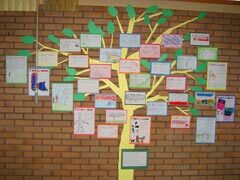 The also created a Dream Tree featuring student dreams and goals. "Our school population is small, but our dreams are definitely not!" 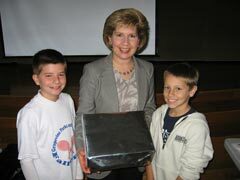 Susan Bosak was invited to HS Paul School to help celebrate "I Love to Read" month. The school has students from kindergarten to grade 8. Everyone had participated in various Dream-themed activities and was excited to meet the author! They contributed approximately 300 Dream Stars – though they weren't exactly stars. Following on the theme of a treasure chest, students decorated large paper replicas of the Canadian one-dollar coin, the "Loonie" (nicknamed after the loon that appears on one side). On the backside, each student wrote his or her dream or goal. They ranged from "Peace in the world" to "I want to become a teacher." One student offered both a dream for himself – "I want to be a cartoonist, an astronomer, or a surgeon" – and a dream for our world – "I want to stop global warming." As part of their Read Across America celebrations, Allendale invited Susan Bosak to share Dream. Kindergarten to grade 6 students contributed over 500 Dream Stars. Some stars represented dreams for the world, others were dreams for the community, and still others were dreams for the writers themselves. Even the teachers participated, each creating a large sheet with an elaborately decorated Dream Star – some complete with glitter! – and their personal dreams. Teachers posted these sheets along the hall so that students could read them as they stood in line for lunch every day. School librarian Amanda Marrano, who coordinated the visit and is in the process of adopting a child, shared her dream to create a family of children adopted from around the world. She also shares a favorite quote from Angela Schwindt: "While we try to teach our children all about life, our children teach us what life is all about." 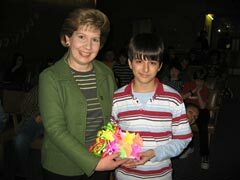 A short trip to Texas allowed Susan Bosak to collect 90 very special Dream Stars from Grade 7 students at H.R. Jefferies. Students made some important connections between the themes in Dream and other texts. Teacher Kate Denning explained that students had also read the book Night by Elie Wiesel and watched the movie The Diary of Anne Frank. "As we learned about these two teenagers and their Holocaust stories, we thought about our hopes and dreams and how different Anne and Elie's dreams were from ours today. We have dreams to grow up and be doctors, fire fighters, businessmen, and various other things. However, Anne and Elie just dreamed that they would survive the Nazi reign and make it out alive. Sometimes we take life for granted and do not realize how lucky we are with the freedoms that we have today." 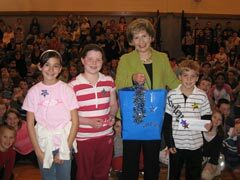 Susan Bosak was presented with nearly 450 Dream Stars from students in grades 1-4 from two partner schools in Hanover, MA. Reading Specialist Pat Peters wrote a special poem to celebrate Susan's visit. The poem reads in part, "Open your hearts!/These dreams are for you,/They nourish the spirit./We offer you this gift/That our dreams may inspire yours./Share our dreams./These dreams are magic seeds,/We will tend them as we grow./Some will bloom as we picture them today,/Some will grow sturdy like a tree and serve the world,/Some like a poem will lead to a new place./Share our gift./These seeds of dreams/Will cycle through our days,/Becoming what they will/As we are becoming/The people who nurtured our dreams./Listen with your heart." "Live Free or Die" is perhaps the strongest and most memorable of all the US states. The phrase apparently comes from a toast written by General John Stark on July 31, 1809, and boldly speaks to a dream achieved of independence. There are lots of popular culture ties to the motto. Live Free or Die is the title of a 1990 novel by New Hampshire writer Ernest Hebert, and a book by Gardner Goldsmith. On the animated TV series Futurama, the motto of the "Neutral planet" is "Live Free or Don't." "Live Free or Die" is the title of the sixth episode of the sixth season of the TV show The Sopranos. It concerns a character who hides from mobsters in New Hampshire and who at one point stares in sadness at the motto on the license plate. And Live Free or Die Hard is the fourth Die Hard movie, released on June 27, 2007. The movie prints were shipped to cinemas under the name "New Hampshire." It's amazing what you can learn as part of the Dream Chain! 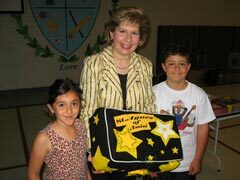 Susan was greeted enthusiastically with 525 Dream Stars from students in grades K-5 at Highland Goffe's. Their simple words to Susan: "Keep on Dreaming!" Bedford is a small rural town outside of Manchester, NH. This winter they almost set an impressive record for the most snow ever – over 100 inches! Students shared with Susan Bosak some of the things they enjoyed doing on all their snow days – staying home, building snowmen, and drinking hot chocolate with marshmallows. In the summer, it does get hot, but the ocean is only an hour away. In the fall, the days are pleasantly warm and the nights are comfortably cool. What was really cool was the 400 Dream Stars students in grades K-4 contributed to the Dream Chain. "We think that no matter where you are, you probably have some of the same hopes and dreams as we do." 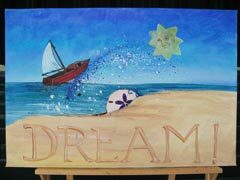 Westtown-Thornbury used Dream as a theme for their school year. Librarian Teresa Finegan knew Susan Bosak's visit was just the thing to bring the book and theme to life for students as they work toward their goals and dreams. All 450 kindergarten through fifth graders created their own Dream Star at the start of the year. The stars have been on display in the school over the last few months. 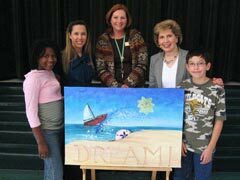 The school created three murals with the Dream Stars to pass along as part of the Dream Chain. Students and teachers shared a simple reminder: "If you work hard and put your mind to it, you can make your dreams come true." 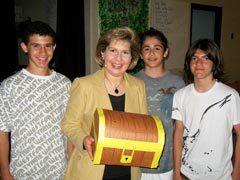 when she visited Greenwood School. Greenwood staff and students proudly describe their school: "Greenwood is a great place to learn and to dream and to make friends. One special thing about our school is that we have many Latino students; so you might hear Spanish if you visit us. Another special thing about Greenwood is that we have a beautiful nature trail and a wonderful garden in our courtyard. We love going outside whenever we can. We like to do all kinds of things – not just reading and math and school things. We like sports, especially baseball. We are musicians; we have a chorus and an orff ensemble. And we are writers – we have our own school newspaper and a little TV station. But most of all, Greenwood students are good friends. We share our dreams with you in a spirit of friendship." K-8. The box was covered in glorious green leaf print paper. That's because the students, parents, and teachers in the school are concerned about the environment and made it one of their focuses this year. "We are trying to find ways to protect the environment by conserving energy. We dream of a world without pollution, where there is clean water and fresh air for all to enjoy. We dream of a healthy future for everyone!" Staff and students at St. Mary Immaculate believe in doing things BIG! 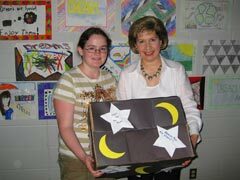 They presented Susan Bosak with not one but four boxes filled with over 420 Dream Stars – the elementary grades did one box, and the grade 6, 7, 8 students each did a box. "We are thankful to be blessed with so much in our lives – a great school, loving families, and a caring community. We enjoy singing, dancing, acting, performing and learning about the world in which we live. We also care about the environment and our biggest dream is that we will find better ways to look after it. We dream that others in the world will share a healthy environment and enjoy the beauty of our world free from hunger and fear. We dream of a world where all people will know the meaning of peace." Susan Bosak actually visited St. Emily twice! The first time, she had just started her presentation when the school had to go into a lockdown because of an incident in the community. She was impressed by how quickly and efficiently staff and students returned to their classrooms to ensure everyone was safe. Since Dreamers are the people with the courage and creativity to keep going in any situation, everyone agreed that they had to make sure Susan came back. The second visit, even though it took place on a day with record high temperatures, was full of energy and enthusiasm. 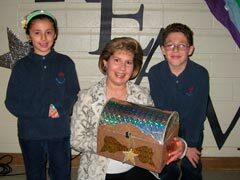 Students in grades K-8 filled a box with 900 Dream Stars and topped it with a big golden bow. Says Teacher-Librarian Linda D'Andrea, who worked hard to make both visits happen, "Written on each star are our personal goals and dreams. We are a character community. At our character assemblies, we take time to acknowledge and show recognition towards the students who are building character, demonstrating a positive attitude toward others and themselves. We are on our life journey to follow our dreams." Teachers at St. Mary read the Dream book to their classes and each student completed a Dream Star with their goal for the future. 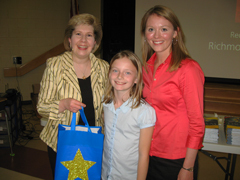 They presented Susan Bosak with approximately 350 stars from students in grades 1-8. Staff and students at the school all strive for excellence. "We realize that when we work hard and try our best, we can accomplish so much more. This was most evident this year when our school worked together to win both the cross-country and track and field meets. We wish that all your dreams inspire you to be the best you can be!" 1-8 as the winners for the pizza lunch in the library. Mrs. Nosad also shared a poem written by Donna Levine, "You Can Be Whatever You Want to Be! ": "There is inside you/all of the potential/to be whatever you want to be,/all of the energy/to do whatever you want to do./Imagine yourself as you would like to be,/doing what you want to do,/and each day, take one step/towards your dream./And though at times it may seem/too difficult to continue,/hold on to your dream./One morning you will awake to find/that you are the person you dreamed of,/doing what you wanted to do,/simply because you had the courage/to believe in your potential/and to hold on to your dream." It was an exciting day of dreams at Maryvale. After lunch with the teachers, Susan Bosak took a tour of the school's hallways decorated with a wonderful variety of stars that each class had created. 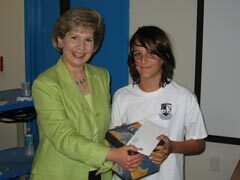 Then Susan did a presentation to all the students in the school followed by an afterschool workshop with the teachers. 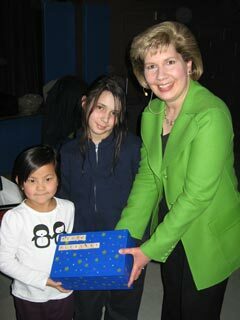 The 500 grade 3-5 students at Maryvale presented Susan with a box filled with Dream Stars – and some pictures of giraffes! The students strive to be giraffes as part of the school's character education program. Says Principal Michael Viscome, "This program focuses on being caring, courageous, persistent, taking initiative, and engaging in helpful action... all characteristics that a giraffe possesses. Are you a giraffe?" a tour of the decorated classroom Dream Doors students created to celebrate her visit and inspire them through the year. After her presentations to two groups of students, she did an afterschool workshop with the teachers. 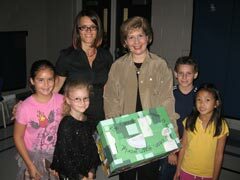 Students presented Susan with 500 Dream Stars in a box made of recycled materials, since Carrville Mills is an eco-friendly school. 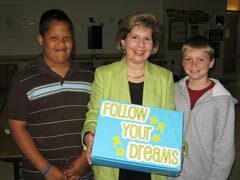 Literacy Coach Anna Bruno is helping the whole school "take our dreams out of the box," referring to this quote from Erma Bombeck: "There are people who put their dreams in a little box and say, 'Yes, I've got dreams, of course I've got dreams.' Then they put the box away and bring it out once in awhile to look in it, and yep, they're still there. These are great dreams, but they never even get out of the box. It takes an uncommon amount of guts to put your dreams on the line, to hold them up and say, 'How good or how bad am I?' That's where courage comes in." The third and fourth graders at Cedar Elementary presented Susan Bosak with about 210 Dream Stars with personal, family, and community goals as well as hopes for peace and kindness throughout the world. Says Principal Fred Morris, "We should never stop dreaming. However, dreams should not be empty wishes. They should be and can be our plans for an even better tomorrow! President John F. Kennedy said it well, way back in the 1960s: 'We need people who can dream of things that never were.' So, please, keep your dreams alive!" 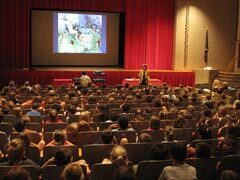 An auditorium full of 360 enthusiastic sixth-grade students greeted Susan Bosak at Furnace Brook. Their Dream Stars reflected everything from career goals to altruistic hopes for a better world, with less war and greater kindness. Says Librarian Teresa DeLuca, "Our school has had the privilege of hosting students from Senmaya, Japan, and in return, our students stayed in their homes this past summer. The exchange of cultural traditions and values enlightened both our communities. Furnace Brook hopes that this exchange of Dream Stars will remind students throughout the Dream Chain just how similar our future hopes are. If through this communication students are inspired to make their dreams a reality, our world will become a brighter place – one star at a time." Susan Bosak spent a full day at South Avenue. After a presentation to students in kindergarten to grade 2, she enjoyed a delicious deli sandwich lunch with the school's journalism students. Each of the 15 students had a lot of questions, and the group discussed everything from where Susan lived to dreams for a world that uses more sustainable forms of energy. Susan was also interviewed for the school TV morning news and the school newspaper. Then, Susan did a presentation to the grade 3-5 students. Because students at the school are concerned about caring for planet Earth, they presented their over 450 Dream Stars in a globe with a latched door they cut in it! Says Principal Ophelia Richards, "We are located in the Hudson Valley about one and one half hours from New York City and just a short walk from the beautiful Hudson River. As we read Susan's book Dream, we had lots of discussions about our dreams and hopes. Of special concern to us is the environment. The illustration in the book that shows famous people received a lot of discussion; we were especially interested in Rachel Carson since she was one of the earliest environmentalists. As a school, our collective dream is to help generate a major interest in caring for the environment. We want to preserve this beautiful valley for all of its inhabitants. We believe such a big dream starts with each one of us doing all that we can to prevent waste." 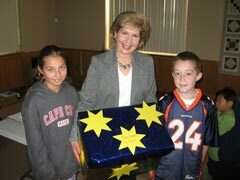 A bright yellow and blue box presented to Susan Bosak contained over 200 Dream Stars from the grade 3-5 students at Purchase Elementary. Because it best represented the Dream Stars of the students, teacher-librarian Deborah Goldstein included a poem by Mattie Stepanek titled Believing for the Journey. In part it reads: "Every day/Everyone in the world/Should do at least/One thing nice for others./Doing so can help each person/Believe in himself or herself/More fully, and/Give confidence that may/Inspire each person/To do more and/More new and good things/For the self,/For others, and/For the world." A Little Something books for students and teachers, it was off to a special lunch with Miss Quitadamo's fourth grade class in their classroom. It was obvious the students had done a lot of research reading Susan's books and looking at the Legacy Project website, because they had many great questions! 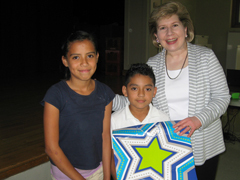 As a keepsake of her time spent with the class, student Miguel Ortiz presented Susan with her portrait, in which she was even wearing a Dream Star necklace. In the afternoon, Susan did a presentation for grade 3-6 students. 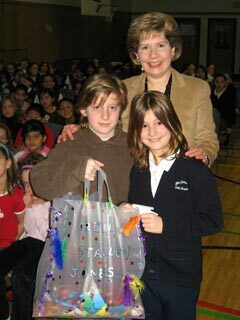 In all over 350 Dream Stars were collected in bags creatively decorated by Sabrina and Parker, the children of parent Gretchen Switzer who put in so much work to make the school visit a success. 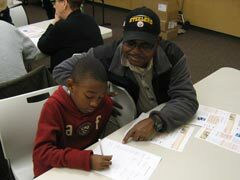 In the evening, families came together for a special multigenerational event celebrating the dreams of Nelson Place students. Susan shared ideas with parents and grandparents for continuing to encourage their children to achieve their dreams. Says Gretchen, "A valuable lesson we learned from Susan is to believe in our dreams and our ability to make them come true. May each of you in every community continue to wish on every star and believe in the power of every wish you make." Inspired by the Dream book, St. Monica's school theme this year is "Teamwork Makes the Dream Work." Susan Bosak did her part to help the whole team of pre-K to grade 8 students by making two presentations during her visit. 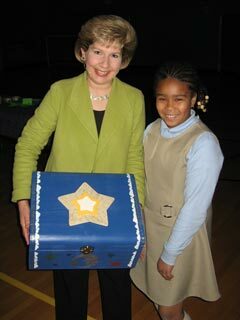 Students presented her with 488 Dream Stars in a chest carefully crafted by Principal Tim Weaver. Mr. Weaver encourages his students and all other Dreamers to follow this pledge: "I will do the right thing today even if I don't feel like it. I will treat people right today even if I don't feel like it. Today I will remember my will power is stronger than how I feel or what I think. All things are possible today." 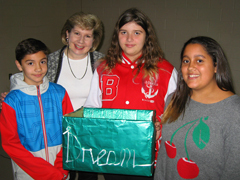 More than 200 students at Northaven created Dream Stars for Susan Bosak's visit. Despite a last-minute computer problem, the technology coordinator at Northaven worked with the Legacy Project team to pull off a successful presentation. Whew! During the visit, it was clear that Principal Louis Padgett and Assistant Principal Marie DeLockery work tirelessly for their students to help give them what they need to succeed in life. Louis Padgett shared some of his thoughts for all students: "I want to tell you that dreams always start somewhere. They are important steps in your life. Anyone can create dreams, ideas and goals that provide and guide toward success. These dreams that provide and guide are both power and powerful. Dreams create mental images that guide your life. Any child can create a mental image that guides him or her to what life could be like if he or she sets a goal and works toward accomplishing that goal. All children are familiar with Dr. Martin Luther King's famous 'I Have a Dream' speech. He had a dream and it became reality. Dreams can become reality. But they have to start somewhere. Always remember that dreams start somewhere. Make sure that somewhere is in you." 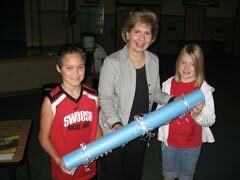 Shawnee Trail was the first school in Susan Bosak's week-long tour through the great state of Texas! The school is near Dallas, located on the historic cattle drive, the Shawnee Trail. With natural light flooding into open common areas, the nine-year-old school has a unique pod design for different grades. 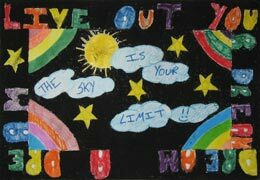 300 grade 3-5 students made Dream Stars and created a large mural covered with the stars. Librarian Pattie Pearson shared several quotations to inspire students to pursue their dreams, including this one from Henry David Thoreau: "Go confidently in the direction of your dreams. Live the life you imagined." Farine is located on the west side of Dallas. One of the school's dreams is to help students through the dual language program, since about 70% of the student body is bilingual. Before Susan Bosak's visit, librarian Renee Newry and other teachers worked with students to help them think about their dreams. They talked about the fact that dreams are whatever we want them to be. They are your own to create and think about, and each person's dreams are different. The dream discussion helped students get in touch with their dreams and to hear the dreams of others. It also helped them understand that they will be able to achieve their dreams more easily because they will be proficient in two languages. 340 grade 3-5 students created Dream Stars. Renee Newry shared this quotation from Harriet Tubman: "Every great dream begins with a dreamer. Always remember, you have within you the strength, the patience, and the passion to reach for the stars to change the world." Mata Intermediate is part of the Alief Independent School District, which has a culturally diverse population – over 100 countries are represented in the district, of which 27 are found at Mata. The experience for Susan Bosak was a little different because she wasn't able to see the entire student body. 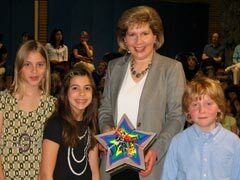 The school has 900 students in grades 5 and 6 (and each created their own Dream Star). 100 students were chosen to be in a live audience in the school's library, while the other students remained in their classrooms watching a video feed of the presentation. But you could HEAR the whole school coming together for the Dream Cheer that was part of the finale! Librarian Alicia Cashion shared a quotation from Mark Twain: "Twenty years from now you will be more disappointed by the things that you didn't do than by the ones you did do. So throw off the bowlines. Sail away from the safe harbor. Catch the trade winds in your sails. Explore. Dream. Discover." The staff and students at Mata hope YOU won't be disappointed because you didn't dare to dream! Teachers and staff at Valley Hi were proudly wearing their blue and yellow "Dream Team" T-shirts when Susan Bosak visited – and even presented her with one! All the teachers are dedicated to inspiring students to Dream Big (the school's theme for the year), and the back of their T-shirts has a quote from John Quincy Adams: "If your actions inspire others to dream more, learn more, do more, and become more, you are a leader." Students in the school are the Dreamers that the Dream Team supports. 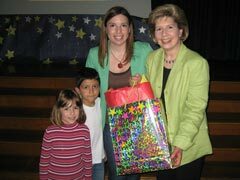 Grade 2-5 students presented Susan with about 300 Dream Stars. Says Principal Daeon Harris, "At Valley Hi we experience the talents and gifts of our students every day. We love working with a talented group of young people and adults who truly believe that their dreams can come true through hard work, effort, goal setting, and beliefs. They inspire and lead others, just as we are inspired by them and hope to inspire them to always achieve more." 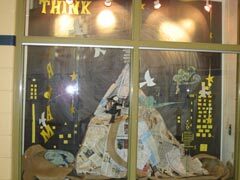 The art and writing created by staff and students at Doc Burke for Susan Bosak's visit was truly amazing! The entire school had read Dream before the visit. Susan was treated to a tour through the school's hallways in which every teacher and student had shared their dreams, inspired by different parts of the Dream book. A wall near the office was covered with the dreams of teachers. Some shared their thoughts about the book, others shared dreams for their families and themselves, and still others shared their dreams for their students. For example, Mrs. Hero who teaches fourth grade, writes to her students, "I know deep in my heart that you can grow into wonderful human beings. I also know that years will go by and you will become older. You may forget my name and what I look like. You may find yourself trying hard to remember. Just remember that someone believed in you and your dream. If you remember that years from now, then I have lived and fulfilled my dream." Each class took their own creative approach to expressing themselves. Kindergarten students colored stars and finished them with glitter. Some classes took photos of each student or drew each student's face in a "thinking" pose, with a thought balloon above their head in which they wrote out the dream they were dreaming. One hall wall was completely covered with yellow stars flowing from a Dream Chest drawn on the wall. There were stars shooting across the sky in a rainbow of colours, and the "Pot of Goals" at the end of a rainbow. Every single student and teacher gets a huge A+ for all their wonderful work! 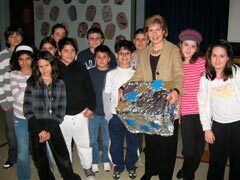 The highlight of the visit for Susan was when pre-K to grade 5 students gave her over 650 Dream Stars and sand dollars tucked into the frame of a painting of a ship of dreams created by the art teacher. Susan Smeby, the school's Reading Specialist who put in so much effort to organize the visit and work with students and teachers on their writing, shares this quotation from William Faulkner: "Always dream and shoot higher than you know how to. Don't bother just to be better than your contemporaries or predecessors. Try to be better than yourself." Susan Bosak will be doing some serious writing on the notepad and note cards with her initials that she received as a "thank you" from Knowlton Elementary. She made presentations to the K-2 students and then the grade 3-5 students. 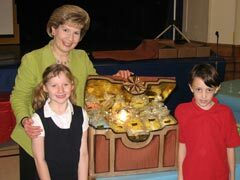 All were enthusiastic about joining the Club of Dreamers and presented her with approximately 740 Dream Stars in a golden dream chest. Teacher-Librarian Kelly Torres welcomed Susan into the library to sign books after the presentations, and shared some of the joys and dreams she has for her own baby girl. Quoting Helen Keller, "We can do anything we want as long as we stick to it long enough." One of the first smiling faces at Raba to warmly greet Susan Bosak was grandparent volunteer Richard Castillo. He gets a front row seat at all school events as the school photographer. His interaction with the students was heartwarming and inspiring to watch! He also made sure to get a photo of Susan with each of his young grandsons because he's making a scrapbook of memories for each of them. 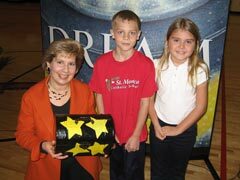 Students in grades 2-5 gave Susan 473 Dream Stars. Says Librarian Jennifer Lockard, "Every child and every adult can dream and have a plan to reach that dream. We hope you'll join us as we follow our dreams and work towards our goals. We wish everyone the best in reaching their dream!" In a cozy space in the library, Susan Bosak gave two presentations at Shepard, the first to K-2 students and the second to grade 3-5 students. The school is the home of the Patriots, and students take tremendous pride in their community and their country. A school of "Believers, Doers, and Thinkers," they have confidence in themselves and each other. Teachers are committed to building a school community that inspires, motivates, and encourages. 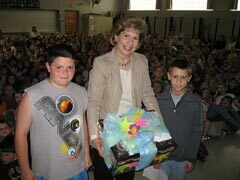 Students presented Susan with 440 Dream Stars. Librarian Susan Seward, who organized the visit and introduced students to the Dream book beforehand, shares this quotation from Eleanor Roosevelt: "The future belongs to those who believe in the beauty of their dreams." South Keller Intermediate School – or, as they like to call themselves, SKI School – is a big school full of big Dreamers. 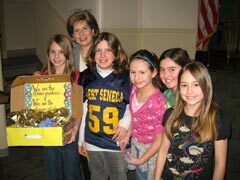 There are 1,000 fifth and sixth graders at the school, who greeted Susan Bosak enthusiastically during the huge assembly. Before Susan's visit, students talked about going far with education, and picking exciting and rewarding careers. They included their dreams on the Dream Stars they presented to Susan in an elegant silver-wrapped box, which of course matches the silver endpapers in the Dream book. Writes Librarian Kim Gardner, "Erma Bombeck, a funny lady who had tons of insight about the world, once said that 'it takes a lot of courage to show your dreams to someone else.' We are showing you our dreams in our silver dream box. We encourage you to seek your dreams and then surpass your wildest expectations once you reach them." Annie Sullivan Middle School is named after the famous teacher of Helen Keller (and is located right beside Helen Keller Elementary School!). 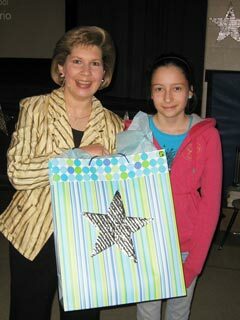 Susan Bosak visited with about 150 grade 6 students and collected their Dream Stars. 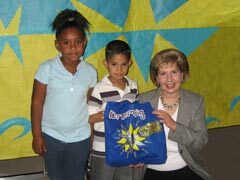 Her visit supported the school's student goal-setting program. The school follows the Fish Philosophy, after the famous Seattle Fish Market: Be There, Make Their Day, Choose Your Attitude, and Play. Teachers foster personal growth, academic standards, culture, and community. Principal Beth Wittcoff shared this quotation from microbiologist Jonas Salk: "There is hope in dreams, imagination, and in the courage of those who wish to make their dreams a reality." 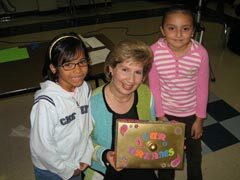 260 grade 2-5 students greeted Susan Bosak at Mount Pleasant, and presented her with a Dream Star box with the school's name creatively spelled out in wooden Scrabble letters! The school's mascot is Moe, the Moose, who encourages students to take care "of myself, others, and the environment." PTO Program Director June Lemen, who organized the visit, points out that our dreams are the first way of taking care of ourselves. She was touched to see how excited all the students were at becoming part of the Club of Dreamers in Susan's presentation. "Our country was built on the dreams of immigrants who came here to flourish. And we do, even now, even in this economy. Even at Mount Pleasant – a small elementary school in the relatively small city of Nashua – we can raise enough money to get an award-winning author to come and share the book she dreamed of with our children. I have to believe in the power of dreams and their ability to come true. After all, it was not so very long ago that I had a dream of being a parent. Now my dream wants to grow up to be a scientist and a detective. 'Can I do that, Mom? Can I be two things?' she asks me. 'Yes, Lucy. You can be whatever you want,' I reply. You can. I can. We all can. As long as we believe in our dreams." Susan Bosak spent the day at Sanborn, doing a couple of presentations and having lunch with Mrs. Price's delightful grade 4 students who had won the school's reading challenge. Students from kindergarten to grade 5 made 352 Dream Stars. Sanborn's theme this year is "Our Journey to Success." In addition to reinforcing Sanborn's values embodied by the four R's – Respect, Responsibility, Resourcefulness, and Reflection – they are celebrating their theme by helping students identify what they do well because successful people understand their strengths and build their lives on them. Principal Patty Barrett quotes Oliver Wendell Holmes: "Greatness is not in where we stand, but in what direction we are moving. We must sail sometimes with the wind and sometimes against it – but sail we must and not drift, nor lie at anchor." Author Susan Bosak spent a full and exciting day with students at Trahan, including a lunch with grade 3 and 4 students who had plenty of great questions! 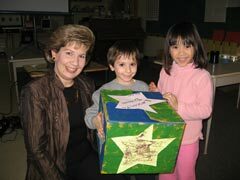 372 students from pre-school to grade 4 made Dream Stars for the school's box. Principal Ed Foster quotes Jane Goodall, who has dedicated her life to studying and protecting chimpanzees after receiving a stuffed chimp as a gift from her father when she was a young girl; she shares what her mother told her: "If you really want something, and really work hard, and take advantage of opportunities, and never give up, you will find a way… follow your dreams!" 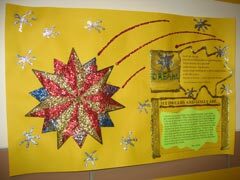 Students in grades 4-8 created approximately 420 Dream Stars for Susan Bosak's visit. She did two presentations at the school for different grades. Teachers and students were enthusiastic. The word in the hallway from students after the presentations? "It was awesome!" Principal Anna Maria DiGiammarino shares this message for Dreamers everywhere: "Each person is a Dream Star. Each life is the day to day realization of the Dream. The quest of all humanity is for each person to be faithful and truthful with himself/herself about their Dream." 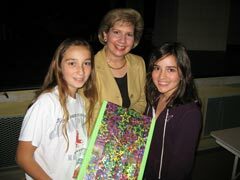 200 Dream Stars were prepared by students in grades 5-8 for Susan Bosak's visit. On behalf of the school, teacher-librarian Rose Whyte shares this message about allowing your inner light to guide you: "There comes a time when you must stand alone. You must feel confident enough within yourself to follow your own dreams. You must be willing to make sacrifices. You must be capable of changing and rearranging your priorities so that your final goal can be achieved. Sometimes, familiarity and comfort need to be challenged. There are times when you must take a few extra chances and create your own realities. Be strong enough to at least try to make your life better. Be confident enough that you won't settle for a compromise just to get by. Appreciate yourself by allowing yourself the opportunities to grow, develop, and find your true sense of purpose in this life. Don't stand in someone else's shadow when it's your sunlight that should lead the way." Teacher-Librarian Catherine Milani, who creates her own jewellery as a hobby, made each member of her Dream Team at the school a star necklace. 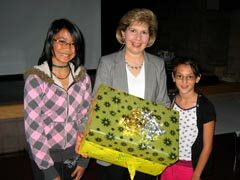 As a keepsake from the visit to St. Francis of Assisi, she presented Susan Bosak with one of the lovely star necklaces. Look for that sparkly star necklace when Susan visits your school! 300 kindergarten to grade 8 students created Dream Stars. They shared the poem Follow Your Dreams: "You must follow your dreams/You must follow wherever it leads./Don't be distracted by less worthy leads./Shelter it,/Nourish it,/Help it grow./Hold your dream deep, down deep where dreams grow./Follow your dreams,/Pursue it with haste,/Life is too precious, too precious to waste./Be faithful,/Be loyal in all the day through/The dream that you follow will ultimately come true." 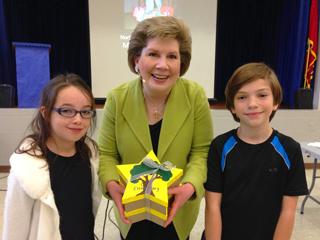 Susan Bosak was the featured author at Redstone's annual literacy day called R.O. @.R – Reading Only at Redstone. Teacher Marguerite Gervan and her team put in weeks of work to bring the day together. Other invited guest readers included local firefighters, police officers, teachers, parents, school board officials, and reporters. One extra-special guest for Susan was her mother, who inspired Dream! After a school-wide assembly to kick off the day, some students went to small-group readings while others enjoyed a presentation by Susan. 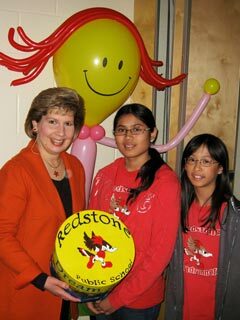 600 kindergarten to grade 8 students created Dream Stars, which they presented to Susan in a decorated round box emblazoned with the Redstone logo, the Roadrunner. They also shared the Redstone song. Here's part of the song: "We work hard and we play fair,/we all know that success is there./Prepared for what lies ahead,/'cause we're all here building our future./One stone at a time, how high can you climb?/The future is bright, the path is clear,/The time is right, we're together here/At Redstone… at Redstone." Ravinia School is located just north of Chicago. With a history of more than 100 years as a public school, Ravinia is a high-energy school. Their mission statement is simple: to nurture every child as an individual; to empower every child as a learner; to inspire every child to become a contributing member of the community. 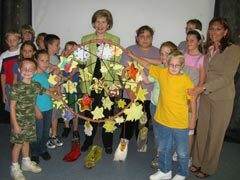 For Susan Bosak's visit, students created 318 special Dream Stars. Each star had a student's dream on the front, and a learning action strategy on the back. Principal Jeanne Banas sets the tone at the school for teachers, students and their parents: "Some of our goals are quite lofty, but we believe in the words of Walt Disney, one of the original Dreamers: 'All of our dreams can come true if we have the courage to pursue them.' It is possible for one voice to make a difference in our world. When we join our voices together, however, the possibilities are endless. We invite you to join the Ravinia Club of Dreamers and dare to dream with us!" A school for fifth and sixth graders north of Detroit, Avondale Meadows is becoming a leadership school in which students encourage each other to dream more, learn more, do more, and become more. Susan Bosak's visit helped to launch the school's new direction. Students created approximately 300 Dream Stars, including 56 stars to represent the 56 people who signed the Declaration of Independence, the Dreamers who started the United States of America. Explains teacher Laura Amatulli: "At our school all students study the founding of America. We study each of the brave people who began our country and the obstacles they had to go through to create a new country with a brave new government run by the people. These people were Dreamers who dreamt of a world where all people are treated equally." 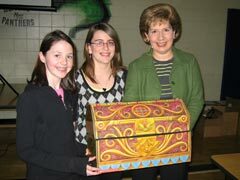 128 Dream Stars in a decorated chest greeted Susan Bosak when she gave a presentation to grade 6, 7, and 8 students at San Marco. 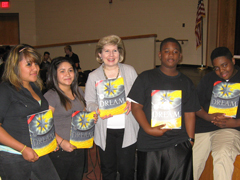 Each graduating student at the school received a specially autographed copy of Dream. Teacher-Librarian Rosanna Russo shares this bit of wisdom for her graduates and for all Dreamers: "They say that yesterday is history, tomorrow is a mystery, and today is a gift. We're all on this earth for a reason. And we all make a lot of mistakes and make the wrong choices, but what it all comes down to is that they happen for a reason: so we can learn from them. No one is perfect or the same, and that's what makes everyone special and unique. If you're in a tough situation and things are going wrong, if you feel it's like the end of the world, don't give up. When one door closes, another one opens. Reach for the stars and make all your dreams come true." From helping animals as a veterinarian or sharing stories as an author, to becoming mothers and fathers or helping to preserve the earth's resources, students at Babeck know that if they put their minds to it, they can make their dreams come true. 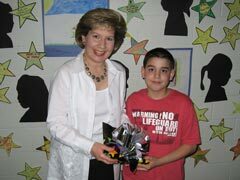 Grade 2-5 students made 250 Dream Stars for Susan Bosak's visit. 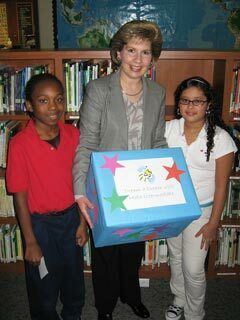 The school received a special grant from a local company to make her visit possible. Says teacher Teresa Bowyer, "Babeck students love to dream! We dream every day, which is evident in all we do. We know that big dreams start small, so we try to do everything we can in our school and community in the hope that we may one day change the world." St. Brigid created 187 Dream Stars. They packaged their stars in a model of their school floating on a cloud (to represent dreams) with a happy face sun to symbolize that their school is a happy place! The Dream book and Susan's end-of-year visit bookended a school year that began with Principal Jo-Ann Donnelly sharing a story about Hermie, a caterpillar who doesn't think he's special. "Students, staff and parents work together to ensure the success of our students. We understand that we all have unique gifts and talents to share with one another and we continue to foster this spirit throughout the school year." Teacher-Librarian Melanie Fintelman helped organize the visit and shared this quotation from Eleanor Roosevelt: "The future belongs to those who believe in the beauty of their dreams." 145 Dream Stars created by grade 7-8 students at St. Clare were boxed in a very unique atlas to symbolize the students graduating and moving to high school. These students are on a spirited journey towards a promising future! Teacher-librarian Deborah Fazari shared these thoughts: "Many of our dreams may be the same dreams that you wish for in your lives and for our world. Our wish for you is that all your hopes and dreams come true. Remember to always dream, because each Dreamer can make our world a better place." When asked to create a Dream Star package that represented their school, students thought it was a wonderful coincidence that their sports teams are the St. Agnes of Assisi Stars. The school is proud of the achievements not only of their sports teams but of all their students. Grade 2-8 students made 380 Dream Stars. 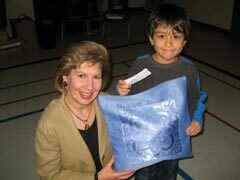 Susan Bosak was particularly touched by a story a teacher told her after her presentation to the grade 2-4 students. There was a nonverbal, autistic boy in the audience. He sat and listened intently to Susan's hour-long presentation. When students returned to their class to practice the "Believe, Do, Think" gestures Susan had taught them, he joined in with everyone else. And, to everyone's surprise, he even repeated the WHOOSH Susan had students do during her reading. The best compliment Susan has received in a long while! Says Amalia Scott, the school's Principal: "We know that it is commitment to one's dream as well as effort that takes a person further than they would go using natural abilities alone." 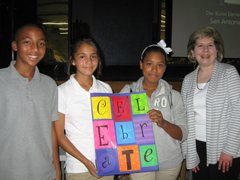 Susan Bosak did two presentations at OLA – one for grades 4-5, and a second for grades 6-8. 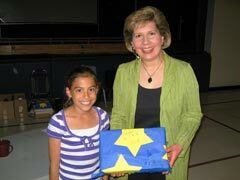 The grade 4-8 students presented her with 240 Dream Stars in a decorated box that matchs the blue and yellow colors in Dream. Teacher-librarian Lisa DeFina shares a simple, direct message for Dreamers everywhere: "Always be kind to yourself and each other. Follow your heart and your dreams. Strive for peace." Ventura Park has a dream theme for their school year, and their school motto is "Rising to the Challenge, Reaching for the Stars." So teachers and students were really looking forward to Susan Bosak's visit. The school is currently under transition to a new French immersion program; this year it has grade 1 students, and then grade 6-8 students (a sandwich with no filling!). 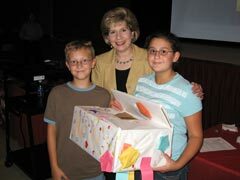 Susan did special presentations for both groups, and an afterschool teacher workshop. 396 Dream Stars were packaged in a unique dream pillow – complete with the message "Pleasant Dreams." Principal Kim Wagner shares this message: "Wherever you go in life and whatever you choose to be, remember who you are; make every effort to be a good citizen. Build positive relationships with people you meet, celebrate their similarities and value their differences. Believe in the importance of the role you play in fostering inclusion in our ever-expanding global community." 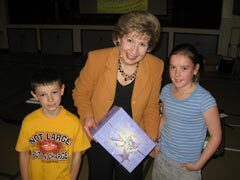 200 St. Joseph students in grades 1-8 presented Susan Bosak with their Dream Stars after two presentations at the school. The school's motto is "Dream and Act, Believe and Achieve." Says Teacher-Librarian Elaine Williams: "We hope you are inspired to set your goals high, and through your actions and belief that all dreams are possible, accomplish great things!" Susan Bosak had a great time getting to know students personally during small group workshops in the morning, and then did an assembly for grade 4-8 students in the afternoon. Approximately 400 students created Dream Stars. Morning Glory is located in a rural area near a native community. Many native students are part of the school. Morning Glory encourages respect of other cultures and has started teaching the Ojibwa language at their school. Librarian Audrey Bodkin works to help all students "dream big. Everything that is or was started out as a dream. May your dreams flourish and take you where you want to be." My mouth curves into a smile/But just as quickly disappears/I realize my dream is impossible/I smile once again/Or is it?" 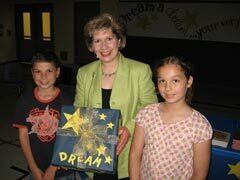 Graduating students at Our Lady of Fatima will receive a copy of Dream, each specially signed by Susan Bosak during her visit to the school. 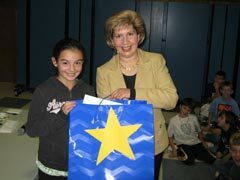 She presented to grade 1-8 students, who made a total of 630 Dream Stars. Acting Vice Principal Michael Sullivan introduced Susan, and described the different kinds of gifts we receive. You might get a new pair of running shoes, or a new shirt. He just received an iPod – but it was already broken. Those kinds of gifts last only for a short time. But the gift of a book, and the gift of encouraging a dream, last forever. The school shared one of their favorite quotations from Henry David Thoreau: "Go confidently in the direction of your dreams. Live the life you have imagined." 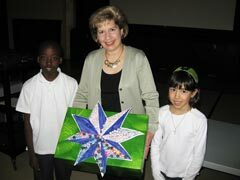 Hallways full of bright Dream Stars and detailed artwork greeted Susan Bosak for her visit to St. James School. Grade 1-8 students prepared for four months leading up to Susan's visit – exploring Dream and doing a variety of LifeDreams activities. 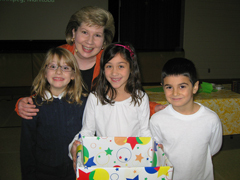 They presented Susan with 540 Dream Stars in a decorated box. Susan toured the school to see all the work done by teachers and students at every grade level. The whole school came together to celebrate the common theme of dreams and goals – no matter what age or ability. Teacher-Librarian Pat Mandaliti shares these thoughts for Dreamers everywhere: "Keep your dreams alive. Understand to achieve anything requires faith and belief in yourself, vision, hard work, and determination. There are some people who live in a dream world, and there are some who face reality; and then there are those who turn one into the other. The only thing that will stop you from fulfilling your dreams is you. So dream a dream, your very own dream – and live it!" 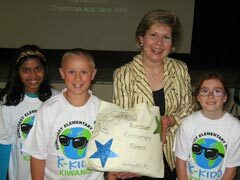 915 K-5 students at Suncoast created Dream Stars for Susan Bosak's visit to their school in sunny Florida. 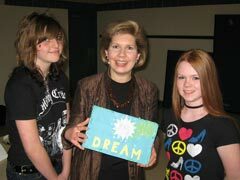 Principal Lisa Braithwaite read Dream to students before Susan's visit, and encouraged each classroom to express their hopes and dreams through a variety of creative artwork covering the school's walls and doors. A teacher workshop after school gave teachers more ideas for ways to continue the year-long dream theme. The local newspaper did an article about Susan's visit. Staff and students shared a narrative by Donna Levine, part of which reads: "There is inside you all of the potential to be whatever you want to be. Each day, take one step towards your dream. And though at times it may seem too difficult to continue, hold on to your dream. One morning you will awake to find that you are the person you dreamed of, doing what you wanted to do, simply because you had the courage to believe in your potential and to hold on to your dream." 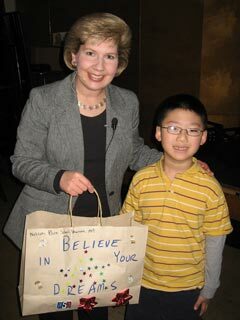 Susan Bosak shared an intimate afternoon with 95 grade 6-8 students at Matthews Hall. 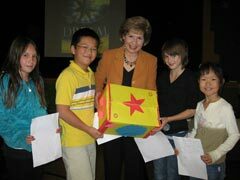 Susan's talk was followed by a lively Q&A and the presentation of a Dream Star box. Matthews Hall is an independent school. Its origins trace back to 1918 when a young woman named Kate Matthews began teaching five nursery school students. The school's values are at the heart of everything students do; the school motto is "I must, I can, I will." Enrichment Program leader Natalie French shared these thoughts: "Our students have envisioned personally satisfying futures where they will be able to make significant contributions to their community. Identifying personal goals has been an inspiring exercise and is an integral step in the BELIEVE, DO, THINK process of turning dreams and wishes into reality." Principal Barbara Mellett enjoyed Susan Bosak's visit so much at her last school that she invited Susan to her new school. 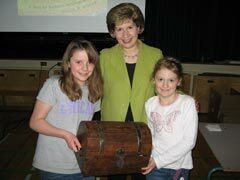 Susan started the day at Osborne with a presentation to the grade 2-6 students. Grade 5 students presented her with a special version of the word "DREAM," each letter decorated in a unique way to symbolize one part of the book Dream. 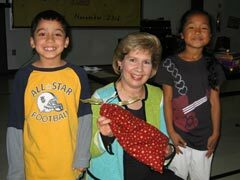 Then Susan was off to a workshop about dreams across a lifetime with grade 3-4 students and their grandparents and grandfriends. 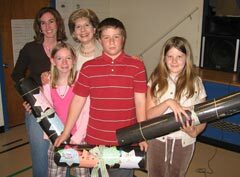 Osborne has had a strong intergenerational program at their school for many years. After the workshop, it was time for a book signing and lunch with grade 5-6 students. During a Q&A session, the students asked dozens of thoughtful questions. As a bonus, a visiting principal from China dropped in to meet Susan and was delighted when Susan gave her a signed copy of Dream. The Chinese principal was very impressed with the creativity encouraged in American schools. Summed up Barbara Mellett, "Susan's visit was everything we dreamed of – and more!" They say everything is bigger in Texas, and the students at Hubenak gave Susan Bosak a big Texas welcome to their school. 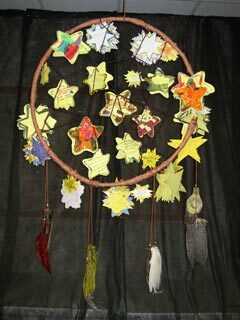 Grade 3-5 students prepared 320 beautiful and inspiring Dream Stars for the Dream Chain. Teacher Michelle McManners arranged for the visit after she heard Susan speak at a workshop, and got a grant to cover all the expenses. She shares these thoughts with her students and with students everywhere: "Dreams are what build the future and we want you to dream big. You could be the one to make a difference in a person's life, your community, or in the world. You could be the one to make a change that impacts generations after you. You could be the one that makes the world a better place. With a little bit of imagination and a lot of work, your dreams can not only come true, but could inspire others to dream big too. Each and every student is a star, but it's up to you to decide how bright you want to shine. Let yourselves be the light that makes dark nights bright." Susan Bosak spoke to over 600 grade 7 and 8 students at Roosevelt. After the formal presentation, students eagerly shared their dreams for their future and told Susan all about their school. Nicki Parkhill, the Assistant Principal, helped arrange the presentation and shares these thoughts about the students in her school: "We truly do have the best kids. Our kids are fighters in that they fight to gain recognition for the hard work that they do. Our kids are lovers of their multifaceted culture. They are versatile. Their ability to have two feet planted in two different worlds and embrace the challenges each presents shows their commitment to themselves and their future. Our kids overcome stress-inducing circumstances and yet shine and exceed our expectations on a daily basis. Our kids are DREAMERS, but they aren't asleep. They are awake. They are aware. They are doing the things to make their DREAMS a reality." A theater full of students, each with a dream. That's what greeted Susan Bosak when she visited Centennial. Susan spoke to grade 7-8 students, grade 9-12 students, and then the teachers after school and the parents in the evening. It was an exciting, full day! The education reporter from the local newspaper attended one of the presentations and experienced the students' dreams firsthand. 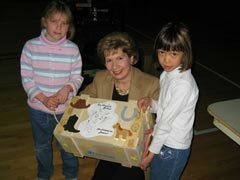 The program director from a local retirement community, who understands the vital value of intergenerational connections, also listened in, interested in connecting seniors with students to make a difference in the community for all ages. Crystal Barber, the Transformation Coach, urges students to "NEVER forget that your dreams can come true. Despite what others tell you and despite the examples you have around you, YOUR dreams have value. Your dreams are important. YOUR dreams will become YOUR reality. Keep this message close to you each and every day. Spend time with people who will encourage, not discourage, your dreams." 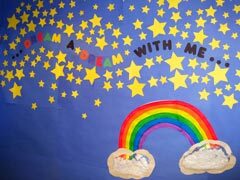 Nearly 200 grade 2-5 students at Shidler creatively decorated their Dream Stars to represent their dreams and their personalities. Students and teachers were so excited to hear Susan Bosak speak, and gave her a warm welcome. Susan shared the story of Sonia Sotomayor, the first Hispanic Justice of the Supreme Court. Like Sotomayor, many of the students at Shidler come from difficult circumstances; but that doesn't mean they're not ready to Believe, Do, Think their dreams into reality. As students left the presentation, they were delighted to each receive their very own copy of Dream as a gift from the school. Said one little girl, "This is the best book ever! I'm going to take really good care of it and read it every day!" Transformation Coach Cheryl Garrison shares this message with children everywhere: "Our wish for you is to always believe in your dreams and to know that anything is possible if you work hard enough at it. Your dreams can become real and you can be an inspiration to others to dream BIG! Surround yourself with people who want the best for you and that will encourage you to follow your dreams." 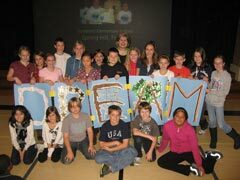 Students in grades 2-5 wrote their dreams on nearly 200 creatively decorated Dream Stars for Susan Bosak's visit. Susan did a high-energy presentation and a book signing, learning all about the dreams of staff and students. Teacher-librarian Bev Baxter knows that YOU can make a difference, and shares one of her favorite stories: An old man was on a beach where stranded starfish lay dying in the sun. He saw a young man throwing them back into the sea. Commented the old man, "There are miles of beach; you won't make much of a difference." Throwing another starfish into the sea, the young man replied, "It makes a difference to that one." 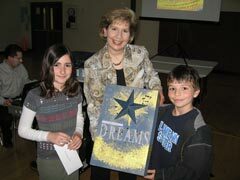 Grade 6-8 students interacted with Susan Bosak and shared their 130 Dream Stars. After a presentation, Susan signed copies of Dream and answered questions. 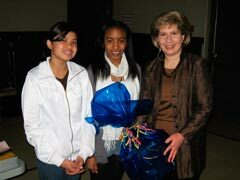 Susan encouraged students to dream bigger than they think they can, and to make good choices. She talked about her own personal goals and how she's always taken "the road less traveled." Teacher-librarian Bev Baxter echoed that by sharing the lines from the famous Robert Frost poem, "Two roads diverged in a wood, and I – /I took the one less traveled by,/And that has made all the difference." 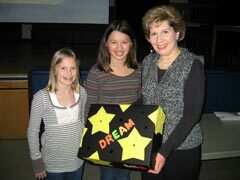 115 Dream Stars by grade 6-8 students filled a creatively-decorated box at Lakewoods. 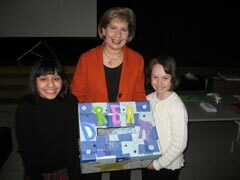 Susan Bosak shared an inspiring presentation on dreams and goals with students. A local artist sat in, who will be doing a mural with students for the school wall as a follow-on to Susan's visit. Teacher Arlene Cole was touched by reading many of the students' messages on their Dream Stars. Some thoughts from students: "I hope to learn from my mistakes" and "I hope to achieve greatness" and "I hope for people in the world to love one another." In the words of Harriet Tubman, "Every dream begins with a dreamer. Always remember you have the strength, the patience, and the passion to reach for the stars to change the world." 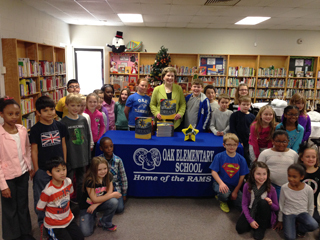 Susan Bosak was greeted with two beautiful star-shaped boxes, decorated with a handpainted Oak tree and filled with 650 Dream Stars – one from each student at Oak Elementary. 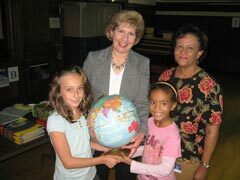 Principal Marie DeLockery had been at another school Susan Bosak visited several years ago. When she became the Principal at Oak, she knew she wanted Susan to inspire all her students. The morning presentation with pre-K to grade 2 students was high-energy and fast-paced. Then Susan enjoyed a delicious lunch with a selected group of students, parents, and school district representatives. Students at lunch had a chance to share their dreams with Susan in a more personal setting. 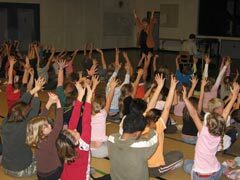 In the afternoon, grade 3-5 students engaged in a thoughtful presentation with Susan. The Oak Elementary mascot is the ram, representing toughness toward challenges. In the same way, each student at Oak takes on a personal challenge to work toward a goal that might initially seem "impossible." But they continue reaching, they keep striving. Very often, the impossible becomes possible with the support of teachers, parents, grandparents, and the larger community. Mrs. DeLockery shares the words of Ralph Waldo Emerson, "The creation of a thousand forests is in one acorn." She continues: "At Oak, we grow forests one child at a time. Through the encouragement of the teachers and staff, students are nurtured to grow to their potential. Oak serves many special needs students. Some children do not speak; some do not walk. Some children are as young as three years old. Through instruction, patience, and trust, our special needs children as well as the rest of the student population dream of what lies ahead – middle school, college, careers! Oh my! May all your dreams come true as you reach for your very own star." WHO WILL BE NEXT IN THE DREAM CHAIN? JOIN US!